Despite its ups and downs the Wii U has delivered a relatively small but distinguished library of excellent first-party games, in some cases using stronger technology and HD resolution to deliver experiences that we'd have only dreamed of in the past. Mario Kart 8 arguable delivers on that promise of taking a key Nintendo franchise onto another level. The arrival of MK8 in Spring 2014 wasn't initially as perfect as it could have been. Perhaps due to the challenges of incorporating a shiny HD engine it missed what would have been a perfect Holiday 2013 release; if it had landed in that window it would have given the Wii U a double hit - with Super Mario 3D World - to rival the 3DS line-up of that period in 2011 - which featured both Mario Kart 7 and Super Mario 3D Land. As it was it didn't quite make it for that window, and in other sources of complaint the GamePad didn't offer a fifth player or full-screen off-TV viewing in multiplayer, and the Battle Mode was - and still is - a disappointment. We decided to get those negatives out of the way quickly, as overall it's a title packed with positives. At launch it captivated with its delightful visuals and - perhaps more importantly - its 60fps performance in both single player and two player splitscreen. For those that argue the difference between 60fps and 30fps isn't a big deal, we only ask that they alternate between two and four player splits in this title and re-assess. Even better was that Mario Kart 8 also delivered some of the best net code that Nintendo's managed to date; no online experience is absolutely perfect, but online races still rock along with glorious smoothness when using a solid connection, and considering the importance of competitive racing to the franchise that was a huge win. Moving on to all-important gameplay, MK8 delivered two key improvements. First up, and that which defined a number of designs in new tracks, was the anti-gravity mechanic. Sensibly the player's perspective always remains the 'right way up', but when anti-gravity is activated the track and surrounding world can be seen to flip and twist as you race, making for some spectacular visuals. Secondly we have expanded vehicle customisation, in which you can switch and alternate wheels, vehicle body and gliders. This wasn't entirely new, but was certainly beefed up a fair amount, while this entry also retained bikes from its Wii predecessor. When you consider the wealth of control options incorporating the traditional and motion controls introduced on Wii, this felt like an impressive accumulation of ideas. This entry was a landmark for its franchise in more ways, too, primarily through DLC. It was the first series entry to have additional content, and these extras also took the series away from the Mushroom Kingdom cast - this had previously happened in the Bandai Namco-developed arcades. Much excitement came with tracks and characters featuring F-Zero, The Legend of Zelda and Animal Crossing, with these DLC packs and 'season pass' also being priced very competitively. It's a title that's featured free updates too. Costumes unlocked with amiibo scans were expanded, while an all-new 200cc mode has added a new level of chaos to races. 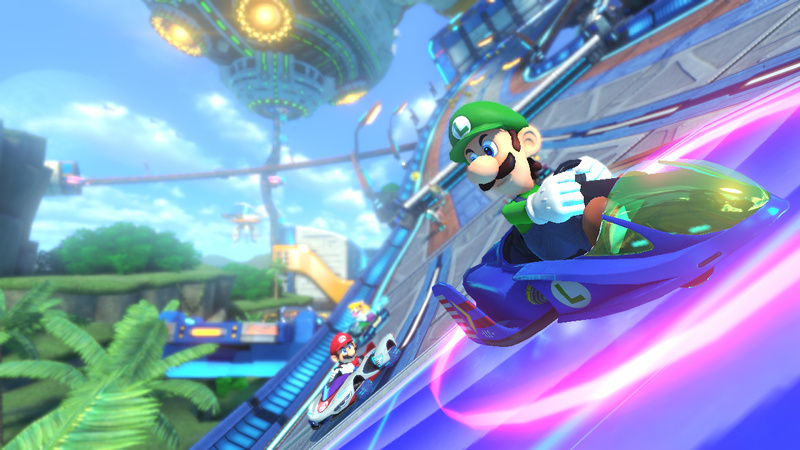 Overall, Mario Kart 8 has been a critical and commercial success on Wii U. At the time of writing it stands as the best-selling game on the system, even surpassing 32GB model pack-in (in the West but not in Japan) Nintendo Land. It's sold 5.43 million units so far. A truly indispensable part of the system's library, it's also likely to be remembered for years to come as an integral entry in the franchise. The greatest Mario Kart game yet I think. Such a fantastic game that every Nintendo fan needs for their Wii U. An incredible game, yes the battle mode is a disappointment, but to me they all have been since Super Mario Kart on SNES. I'm still playing and I got it the day before it's official release date! I would love more DLC... not very often I'd say that! This game is nearly perfect---I will agree that the battle mode is a big disappointment. It is still my favorite Mario Kart game (and I've been playing since the original on the SNES), but the lack of a good battle mode is disappointing. Was hoping they would include it in DLC, but it doesn't look like it. With how great the controls/graphics and online abilities were made, I thought having a great online component to Battle Mode would have made this a perfect game. Bring DLC and amiibo support for Mario kart 7.There is no reason why there is no amiibo support at least. Very fun game. Hands down best DLC in any game I've played, period. It's the only Mario Kart to feature the Death Stare so, obviously, it's the best. The GOAT of all things kart racing. My go-to game any day of the week so obviously it's my favorite Wii U game and also my favorite in the series! Look for Mii online daily! Everything was good... except 150 CC item spam from the CPU. Nothing kills your enjoyment faster then having your effort rendered pointless because they always get what they want. I've cleared 150CC (and mirror) in every Mario Kart from Double Dash onward up to 7. Somehow, 8 seems to break the difficulty. Which is why I quit it out of frustration, at least for a good while. While the battle mode is disappointing, it is still the best Mario Kart imo. Even though I don't like the idea of flame-hopping, this game is still very good. I can flame-hop, I just don't think it's very fair, so I never do. I'm always Luigi on a bike, and I can usually get within the top 3 online without hopping. I guess I'm just tried of seeing so many Morton and heavy characters; you can't tell me that many people's favorite character to play as is Morton! Besides all that, I don't mind the battle mode, but it definitely has it's flaws. What I hate most about it is if someone gets a triple shell, they can turn you into a ghost instantly, and I don't think that's very fair or fun. My favorite battles modes were from Double Dash!! or Wii. This is my second favorite Mario Kart, behind Double Dash!! It's very fun, I just wish there was different battle modes and no flame-hopping. All of the DLC is great though, and 200cc is amazing! A great addition to the Mario Kart series! Ok, pretty incomplete in some aspects, without a victory ceremony, with an HUD which is missing many elements that were present in Double Dash! !, some holes in the roster (Bowser Jr., Birdo, Diddy kong and King Boo at least, which were present in Double Dash!! and Mario Kart Wii), incomplete battle mode without proper arenas and some glitches in the physics and in the game mechanics at the time of release, with firehopping being the worst offender since it penalized the inward drifting bikes. It looks like the developers had a tight deadline, probably due to the missed release on the Holidays of 2013. Yet, this is one of my favorite Mario Karts: it has wonderful art direction and soundtrack, and these aspects are not at the espenses of track design, with antigravity allowing some crazy twists that I really like (in fact, i would like even more crazy tracks full of twists on the style of Dragon Driftway and the Electrodrome!). Furthermore, the driving mechanics are really interesting, with a very "technical" approach based on many short boosts, aided by a revamped physics engine that, especially in land sections, allowed a less frustrating interactions with objects and obstacles (although bumping with other vehicles needed a patch). When 200cc came, its driving mechanics became even better, with the patch of firehops and slides, with a great increase in speed and the need to use brakedrifting that added depth to the driving style. I am also REALLY glad to be able to play as the Koopalings, 25 years after their introduction in Super Mario Bros. 3! And not only that, this game also revealed quite a bit about them, including their job (who thought that Ludwig is also a painter?) and their hobbies (Larry being a DJ in the Electrodrome is surprising to say the least...). But this is just one case of a more general point that is the care for the small details both in the case of characters and in the case of the tracks: the characters animations reveal new shades about them, such as Luigi's death stare and Yoshi being happy when riding inward drifting bikes (see my avatar and compare his idle expression to the idle expression he has while riding outward drifting bikes! ), while the tracks have many small details and Easter Eggs and, if that wasn't enough, they are all interconnected like in Mario Kart: Double Dash!! So, as a TL;DR, this game has its shortcomings and probably is a bit rushed, but its good points are so well done that it's still one of my favorite Mario Karts! @Blue_Blur: both firehopping and slides are patched in 200cc class, but not in the version 1.0 classes (50cc, 100cc, 150cc, Mirror mode), so if you don't like firehopping and want to ride an inward drifting bike instead, 200cc is the way to go! There are many reasons why MK8 is the best Mario kart, but the most important for me is simply that it is the most balanced Mario kart. @Mister_Wu Thanks for the info! I have done 200cc and don't notice anyone hopping, which is a good thing for me, but I didn't know that they patched it! (I just thought no one could handle the speed in 200cc while hopping! ) The only bad thing is that I use an outward drifting bike... but that won't stop me! I kinda wish they still patched it on all the classes... oh well, at least one class is safe! My favorite game ever. Words cannot describe how much I love it. @Blue_Blur Well, 200cc has other changes as well: there is a complete subtiering of the acceleration so that now each increase in the acceleration value results in an increase in acceleration (although the biggest increases in acceleration are still found when you increase the integer part of the value), and when you brakedrift orange sparks come from the vehicles in the points connected with the driving wheels. 200cc is more than just a class with a 50% increase in speed! I still prefer "Double Dash" overall with its excellent Battle Mode, All Cup Tour, and character-specific super items, but MK8 is a pretty close second. It's a beautiful game that fixed most of the problems from MKWii while maintaining the good mechanics added in that game and MK7, and I had a blast when I borrowed it from a friend. Ultimately, though, "Sonic All-Star Racing Transformed" is still higher on my Wishlist, as it has better vehicle transformations and a good Battle Mode (and no Blue Shells, of course). Plus, who doesn't want to play as Danica Patrick and Wreck-It Ralph? Mario Kart 8 has great soundtrack and visuals and a solid circuits list. However, is missing a proper battle mode and it's not as fun as Mario Kart Double Dash! !, and I'm not talking about the two-drivers per kart thing but the driving physics and items. Besides, MK8 drivers selection is unbalanced and missing great past choices (like Diddy). Mario Kart 8 could have been the best, but Nintendo just missed the chance. Mario Kart 8 is great experience. i liked the fact that they brought back alot classic courses from other Mario Kart games! @idork99 Some people call it fire-hopping, but I call it flame-hopping. It's close enough. In all classes except 200cc, it's where if you drift, and then continually press the drift button while moving left and right alternately, you can continue the drift boost and it almost acts like a free mushroom. It makes a big impact, especially if you're a heavy character. It's hard to explain, so if you want to see it in action, here's a past Nintendolife article showing the effects of flame/fire-hopping. MK8 disappointing me. The tracks were gorgeous looking, but disappointing in design (for the most part) I ended playing the retro courses more. I hate how stiff the controls are, as well as a dubious character selection. I suppose its on the lower end for me, and double dash upped some more spaces in my MK list, as I got the chance to play it again and it was fun. I've always thought the original SNES Mario kart would always be my favourite until this came out, the expansion packs have made it even better. If it gets the battle mode right with a final expansion pack then it's perfect. @VanillaLake I would agree on everything except the physics, now that 200cc with its patching of firehopping and slides is out. If you watch the speedometer, you'll see that Double Dash!! has a terrible flaw in its physics in that everytime the vehicle is airborne, a huge amount of speed is lost, to the point that even just going on wooden bridges makes you lose much speed. Furthermore, the grip tend to be quite low, so that often you miss items or go out of the track even when on asphalt. The bumping physics on the other hand tend to be quite good, in my opinion even better than in Mario Kart Wii, the only problem was that sometimes collisions with track borders result in the vehicle completely stuck instead of a bump. Still, for the time the physics of Mario Kart: Double Dash!! is really good and a step up from Mario Kart 64, it is surely better than Mario Kart 8 before 200cc in that it only has debatable aspects but not gameplay-breaking bugs such as firehopping and slides. Now that 200cc is out I would say that Mario Kart 8 handles bumps and airborne situations better and also has a new feature on land sections that allows four-wheeled vehicles to tilt, so I would say it's a bit better. @Blue_Blur I never knew of this technique! Although I did purchase from day one, I didn't really get into it till the 2nd pack came out. I was still playing MK7 since that's all my friends had. But slowly but surely they've been playing more MK8 so I've finally made the full transition myself. I'll have to try this tonight! Thanks again @Blue_Blur! @Mister_Wu I think I didn't explain that part properly. I mean that driving in Mario Kart Double Dash!! is more fun (arguably the best), perhaps because of the road bumping, the way the karts turn and the convenient speed. Mario Kart 8 200cc looks a bit crazy but I haven't tried it much yet (only Mushroom Cup once). Thanks for the information! @VanillaLake Ah, ok! Now your point is clearer! Double Dash!! 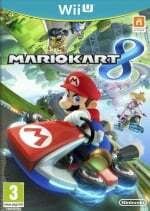 is in my opinion the most polished and complete Mario Kart in that there are no aspects of it which feel rushed. Even if some basic game mechanics have been oversimplified with respect to Mario Kart 64, there are many new ideas which are well executed, and the tracks are amazing in art direction and execution, with only two Lakitu-based shortcut glitches discovered so far. Regarding the driving style, I still prefer Mario Kart Wii and Mario Kart 8 200cc because the manual charged Mini-Turbo is great from a competitive point of view but it also inevitably leads to Mini-Turbo spamming which is not something I really like. Loved SNES Mario Kart but MK8 was the first I bought and I love it dearly, and it's reignited my gaming fire. I'd hardly bought any games before MK8 but in the last 15 months I've probably bought 100 titles on various platforms. None have had the same time investment as MK8 or have had the same impact on me though. It's a special game. Does anyone here know where to find parents with KIDS (ages 13-18) to compete in a Disney XD show called "Clash of the Karts?" I'm casting the show. Just looking for the way to find these kids. YES, parents have to submit their children who are under age 18. Thank you!